Renaissance Park is a large master planned community in south Raleigh and the Revival Collection is an entry level townhouse product within the community. This section of the site includes 254 units of three story back-to-back townhouses. There are two unit types, an end and an interior model which are 1638 and 1742 square feet respectively. 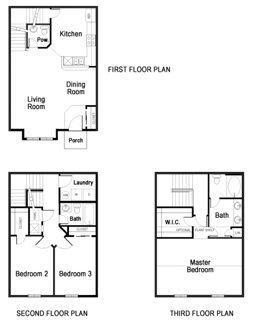 Both models are three bedrooms with the master bedroom on the third level.